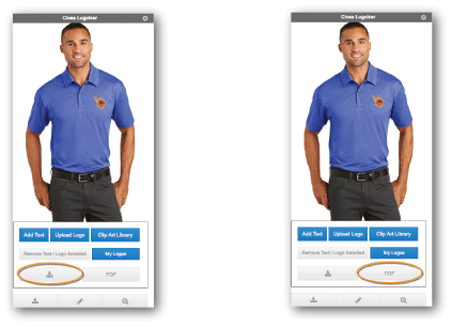 SanMar's Logoizer tool gives you and your customers a virtual design studio for customizing apparel, bags and caps—letting your customers visualize the final product. With this tool, you can easily upload and preview logos on a variety of products. To access the Logoizer tool, click on the pencil icon under the main image on a product page. Upload your own logos or select from our curated clipart library. Once selected, you can easily resize and move around anywhere on the product. Use this option to preview what the screen printed or embroidered final product will look like. 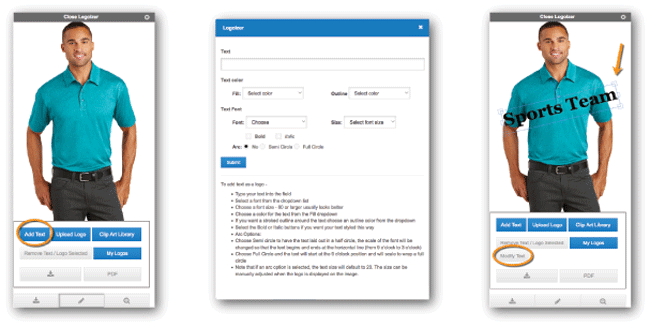 Add a slogan, company name, motto or any custom text by using the Text button. Type a phrase, select a font style, color and size and click on the 'Submit' button. Click and drag the text on the garment to your desired location. You have the ability to edit the text by selecting the 'Modify Text' button. When you are happy with the placement and size of the logo and/or text, you have the option of downloading the image as a PNG file or saving as a PDF. Use these to add the images to your own website or to e-mail to your customer.